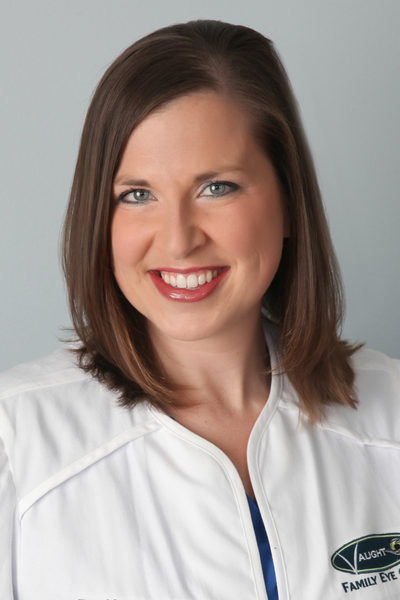 Dr. Vaught graduated from the Indiana University School of Optometry with honors in 2009. While there, she was Vice-President of the Indiana University Optometric Student Association (IUOSA), Vice-President of the Gold Key National Optometric Leadership Society, a four year member of Beta Sigma Kappa National Optometric Honor Society, and an active member in Voluntary Optometric Services to Humanity (VOSH). Dr. Vaught did her optometry training at John Kenyon Eye Institute in New Albany, IN and Louisville, KY and The Richmond Eye Center in Richmond, IN, with concentration in diagnosis and treatment of ocular diseases, such as glaucoma, cataracts, macular degeneration, and diabetic retinopathy. She also did training in the Optometry and Ophthalmology wings at the hospital on Keesler Air Force Base in Biloxi, MS, with concentration in primary care and pre-op and post-op care for refractive surgery procedures. She completed her undergraduate studies at Hanover College in Hanover, IN, where she graduated with honors in 2005. She received a bachelors degree in Biology. While there, she was involved in many campus activities, including being a four year member of Phi Mu. She is a member in good standing of The American Optometric Association, the Indiana Optometric Association, and Women of Vision. Dr. Vaught also performs LASIK evaluations at TLC – Indianapolis on Thursdays. Dr. Vaught currently lives in Franklin, IN with her husband, Adam and her sons, Turner and Mason. In her free time, she enjoys riding roller coasters, spending time with family and friends, and has recently started trying to play golf with her husband. You can contact her with any questions or comments at [email protected].